In defending freedom of speech at the UN, President Obama addressed a variety of audiences, especially the world’s Muslims angry over an offensive video, but he also didn’t want to rile up his political opponents at home. That kept some of the key defenses of free speech off the table, says ex-CIA analyst Paul R. Pillar. 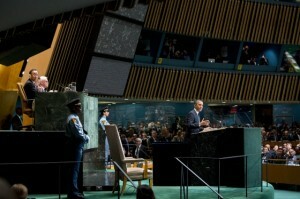 It was inevitable that President Barack Obama would devote a significant part of his address to the United Nations General Assembly to the subject of freedom of expression. The repercussions of the anti-Islam video that sparked violence in several Muslim-majority countries are too recent and too substantial not to have done so. The President began and ended his speech referring to Christopher Stevens, the U.S. ambassador who died in some of that violence. Mr. Obama had to explain why the United States could not have somehow just banned the offensive video. And of course he would have been criticized by his domestic political opponents if he had not delivered a vigorous defense of free speech. What the President said on the topic in his U.N. speech was appropriate for the forum, the time and the circumstances. The address deserves the good reviews it received. All quite valid, although this defense of free speech was still rather narrow. The President discussed the subject in large part in terms of religion. He said it is not repression but rather more speech that is needed to “rally against bigotry and blasphemy.” Use of that last term was unfortunate. Although bigotry and blasphemy are both negative concepts that imply contempt for someone else’s community, and although sometimes both are exhibited by the same warped minds, they really are different things. Some of the most pronounced bigotry is exhibited by those who profess to be most outraged by blasphemy. The term “blasphemy” recalls the intolerance codified in blasphemy laws and the genuine outrage of how some of those laws are implemented. It was probably an effective tactic to convey as one of the main messages of the address that those who are most offended by attacks on their own religion have some of the most to lose through repression of free expression. “Secondly, though the silenced opinion be an error, it may, and very commonly does, contain a portion of truth; and since the general or prevailing opinion on any subject is rarely or never the whole truth, it is only by the collision of adverse opinions that the remainder of the truth has any chance of being supplied. “Thirdly, even if the received opinion be not only true, but the whole truth; unless it is suffered to be, and actually is, vigorously and earnestly contested, it will, by most of those who receive it, be held in the manner of a prejudice, with little comprehension or feeling of its rational grounds. An address by a head of government at the United Nations is not the same as a discourse by a political philosopher, and it probably would have been unwise to try to work this kind of reasoning into the President’s speech this week. But we should keep in mind this most fundamental set of reasons not only for why freedom of speech is something we cherish but also why it should be cherished, even when it appears to collide with, say, someone’s religious faith. We should keep it in mind partly because the ills of restricted expression that Mill described sometimes infect our own public discourse, notwithstanding the constitutional guarantees of the First Amendment. This does not always take the form of false dogma imposing itself, although we see that in, for example, creationist attempts to affect school curricula. More often it involves the political correctness involved in automatic acceptance of a “general or prevailing opinion”, as it might relate to, for example, a foreign alliance or a perceived foreign threat, and quickness in shouting down those who challenge such an opinion. Americans also have their share of doctrine, such as the belief in free enterprise, that has a valid and proven basis but often is held more as if it were the product of a revealed religion, thereby losing a good sense of the “character and conduct” that ought to be applied to particular problems and circumstances. In looking abroad, and especially at the Middle East, the part of the world that President Obama was most addressing in his U.N. speech, we should keep in mind the chief justifications for free expression in order to know what we are wishing on other people. Sure, an immediate wish is that societies not tear themselves apart over sectarian differences, as is going on now in Syria. But people who do not get beyond the immediate preoccupations and the concerns about who is blaspheming whom and who fail to graduate instead to a more prosperous, as well as more just and civil, way of life, will merely be clinging forever, as Mr. Obama might put it, to their guns and religion. A transition to a more prosperous way of life requires an active search for truth rather than merely believing what a local religious leader says to believe. It requires a vigorous interplay of ideas, with competing points of view freely expressed, to discover what works and what is effective. We cannot force people in other countries to think this way, but we should keep all of this in mind whenever we have an opportunity to nudge their thinking in this direction, maybe even explaining this in a speech or two. Don’t even play that game homeslice. Words have meanings zionist isn’t hebrew isn’t jew. The hypocrisy of Obama’s statement is in sharp relief to his Administration’s treatment of Assange as an “enemy of the state” and his prosecution policy for whistleblowers. WHY do we give Holocaust denying loons like Rehmat space on this board??? Couple of things: 1) freedom of speech is one thing; slander is another. As I understand it, the film was not done to analyze a situation, and then speak out against abuses. It was a slander with intent to provoke the reaction that it did. The film did not even qualify as an unbalanced, emotional rant. One of the actresses, actors excuse me, is litigating for misleading her about the content of the film. I am in the minority here, but no, this was slander, and subject to legal action, in my opinion. 2) It is great for Obama to talk about freedom of speech. I would like to see the same for Bradley Manning, Julian Assange, and others like Thomas Drake and the man that turned in all the tax cheats (I am having a senior moment; was it Bradley Birkenfeld?) that sent money to the UBS bank to avoid taxesâ€”many directed by the former senator from Teggzis, Phil Gramm. These and others have spoken the truth about serious matters. How about freedom of speech for them?